This is a recipe that I’ve been making for several years and was based on a recipe by Giada de Laurentiis. It’s quick, and to me, a very spring kind of pasta. Make it when the asparagus are at their best. Heat a pot of boiling water, add asparagus and cook until bright green and crisp tender – kind of the al dente of asparagus. Remove asparagus from water and set aside. 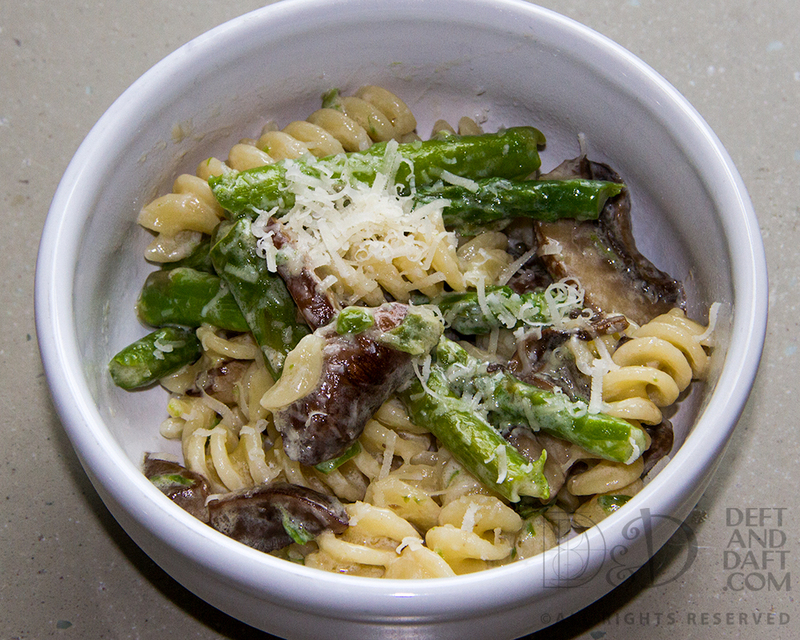 Once the asparagus is finished, add the pasta and cook until al dente. In a sauté pan, melt butter and add a little olive oil. Add the sliced mushroom and sauté until they’ve released their juices and most of that liquid evaporates. Add garlic and sauté for another minute more. Add the asparagus to the mushrooms. Then add the container of mascarpone cheese. Stir until it is melted and coats the vegetables. Add a handful of freshly grated Parmesan cheese and stir again. Serve with extra Parmesan for serving.